Highlights from the day's games in the FA Cup fourth round, including Newport v Tottenham, Liverpool v West Brom and Peterborough v Leicester. Browse content similar to Fourth-Round Highlights - Saturday. Check below for episodes and series from the same categories and more! can be a night to remember. This is an opportunity, it saved. Marcus Browne took the gift. convincing 4-0 win at Yeovil. week at the age of 82.
as they saw off Leeds United. was the greater part of the problem. Newport. Guilty of a foul. chest of his own goalkeeper. Sycerika, looking for Kane macro. but a corner has been given. the game more and more. Spurs know what is coming. famous days in the club's history. This is a huge dozen minutes, huge. be in the right place to pounce. count on him to do it for them. want to hear the whistle now. How quickly can they go? Cheering from Newport County fans. one of the man alive. half. They were motivated to play. to fight, we need to show more. get the result at Wembley. uncomfortable in the first half. They did. I have played at Crewe. press. Knowing when you are covered. my team and this is how we play. they got their just rewards. That was a good delivery. final shocks of all time. and today entertained West Ham. the new signing Maorio on the bench. after just seven minutes of play. the header was just too powerful. Nik Powell down under the challenge. is there... Dunkley is offside. Goodness me, West Ham have survived. box, failed to clear it properly. nearly the two combining once again. the ball off the head of Will Grigg. wish to take over the club. time, Byrne made the mistake. blood to the head. -- Reece Oxford. Grigg, will he go for it himself? here. Grigg. Makes it 2-0 to Wigan. 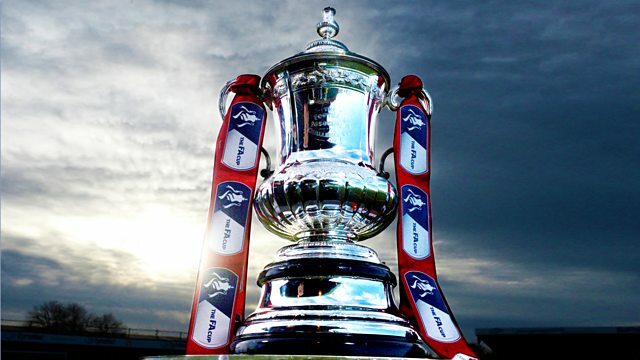 FA Cup journey is set to continue. Joe Hart to make up his mind. current crop of Wigan players on. for a third for Wigan Athletic? space and Powell just missed it. to get back in and that changed it. That is a really poor decision. couldn't string two passes together. relationships and West Ham side. but Nick Powell was on fire today. of the biggest clubs in the world. who was in a Premier League side. players are injured and it is tough. Liverpool through to Round Four. Steve Bower was there for us. terrible start for West Brom. Mignolet. That is how to respond. headed it in. There is a delay. before he gives the goal. He hasn't given the goal. Let us clear this up. referee has disallowed the goal. That is what he is looking at. Pawson the referee is seeing. him. The Brazilian has missed. have got their third goal this time. tie. -- the U's of VA are. lost at Anfield since last April. Firmino, and Hegazi with the block. Salah, 3-2. With 13 minutes to go. create perhaps one more opportunity. centre forward got a touch to it. better of Jurgen Klopp again. attitude and play without fear. they were the right calls. happened, there is no screen for us. in or out. Everyone is in the dark. to be looked at carefully. We have to give him credit for that. you. The penalty was a bad decision. tell him it's wrong and crack on. You think it helped West Brom? need to know what is going on. Confidence can drive you through. Thanks for the moment, guys. still got all of this to come. on BBC One from 3:35pm. to next week's Super Bowl. that's known as the Logan Derby. plays his first game since October. scored in his last five games. Mark Stallard got the goal. it was just too far ahead of Hewitt. ball, hasn't made great use of it. create and get shots away. last few seconds of the first half. will see this as being very harsh. and should have levelled it up. there, Ameobi was in there. City. Good header back across goal. lays it after grand, across goal. Swansea defender is poor here. there. Let's see from this angle. out. The goal shouldn't have stood. if the 1894 FA Cup winners go out. there was a lot more physicality. not getting close down quick enough. should score, should really score. ball was out of play. the ground before it goes...? if only we had VAR. got them a well earned replay. Today, they were at the MK Dons. frontier forward into round five. challenge to concede a penalty. allowed -- Meant an equaliser. season but McCarthy saw it coming. part and took a deserved lead. But no replay for Coventry City. could be a year for them? Coventry literally over the line. Look what it means to the fans. loved him, he played in that game. get a really good time. that this fourth round tie. Leicester City but a strong side. the end of that one. With Silva now, Iheanacho, Diabate. less than ten minutes to score. corner. A great start to Leicester. game. They are two up. place as his team-mate Diabate. Leicester made it look so simple. Iheanacho. Getting clear of Maguire. he wanted it -- Marriott. a bit. It is going to be a corner. City debut, away from the defender. A fingertip save keeps it at three. react and find the back of the net. who on the day were outstanding. Ten, but still a strong team. them trying to play the right way. have the Steele of the century. He may be another find. Iheanacho, a very good forward. haven't seen much of them. must be feeling quietly confident. he might just fit into that mould. to West Ham, you know. of their last six games. Commentary comes from Vicky Sparks. Murray is amongst the subs. challengers again. Wins the corner. direction on it he needed. Shotton will launch this long. Chance the Middlesbrough to break. Fletcher has Traore ahead of him. Goes the goal and hits the post! Looking for the run of Ball D'ard. Gibson clears away. -- Sam Baldock. forward quickly by the home fans. final minute of normal time. couple of minutes or in injury time. clinical -- worked so, so heartland. all you can ask of your subs. matter in the FA Cup, do they? a cool finish from a tight angle. stamp, Wednesday in the draw. Hull City any FA Cup! Dicko as he forced a good save. to whip it into the near post. were very generous tonight, Danny. You go out with a whimper. Jimmy Armfield who died this week. one. Millwall two, Rochdale two. Liverpool, too, West Brom, three. Athletic two, West Ham United nil. Highlights from Saturday's games in the FA Cup fourth round, including Newport v Tottenham, Liverpool v West Brom and Peterborough v Leicester.